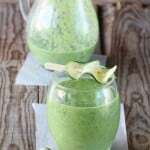 Start fresh this morning with a delicious green smoothie. Fruit adds some sweetness to cover the greens but still gives you the nutrient boost. Put all of the ingredients in a blender – blend until smooth. Drink and enjoy.